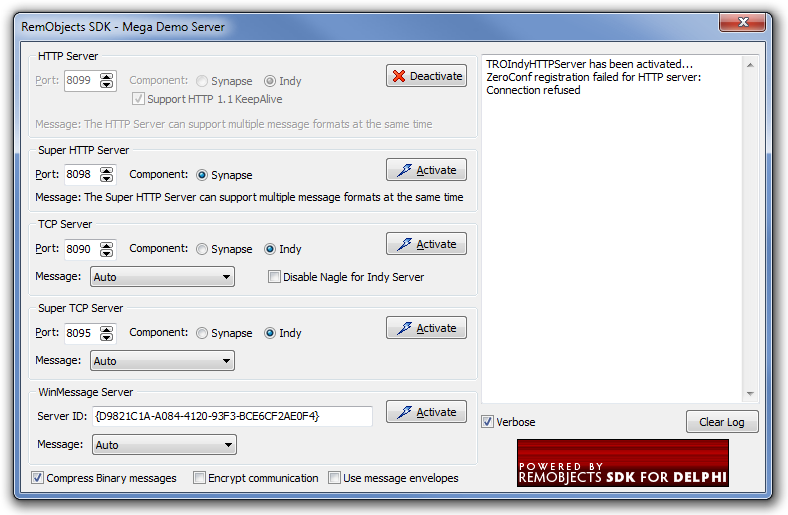 The RemObjects SDK Client sample demonstrates how to use Hydra to share RemObjects SDK connection details (channel, message) between host and plugin. In this sample, we will show how to use a service from both host and plugin. In this sample we will use the server from the Mega Demo sample that is shipped with RemObjects SDK, so the first thing you need to do is to compile the [Mega Demo sample](MegaDemo Sample (Delphi) "wikilink"). The client is configured to use the HTTP channel, so before you can use the client, you need to activate the HTTP server as shown in the screenshot. The client is a regular RemObjects SDK VCL client application, @@@that access to a service exposed by the server@@@. If you need more information on how to create an RO SDK client, please refer to the RemObjects SDK docs. These properties allow you to connect your channel and message components to the module manager, so these components will be transferred to the plugin. btnLoadPluginClick method - Using module manager we are loading the plugin module, creating a visual plugin and showing it in the panel. 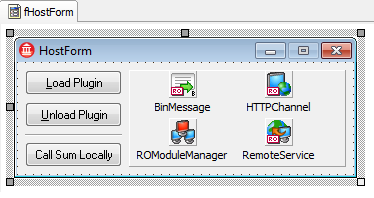 As you can see, there is no difference between a regular module manager and the RO module manager. btnCallSumLocallyClick method - This method calls the Sum method from a remote server. Please note that in addition to the standard packages, both host and plugin use the MegaDemoPackage.bpl package. We are using the shared package to avoid possible issues with multiple types initialization. If the "_Intf" files is placed in a package that is loaded by the host, it will be initialized only once. The module controller is an entry point for the plugin module; it supplies the host with information about stored plugins and provides a method that allows the host to instantiate and work with plugins. The module controller is a singleton, so we can use it to initialize data that can be used by all plugins in the module. 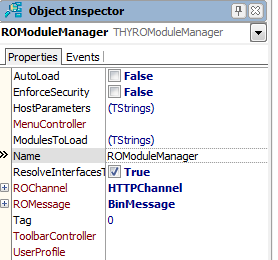 We are using the OnSetHost event of the THYModuleController component, so we can initialize a remote service when the host is set. To initialize our remote service, we are casting the aHost parameter to the IHYRemObjectsHost interface, and now we can access the host channel and message components. Please note that you should always check if the aHost parameter is nil, as the host will clear its reference on module unload. We can do this initialization on the plugin using the same OnSetHost event, but if there is more than one plugin that requires access to the host components, we will need to initialize every plugin, and with module controller we can do this only once. Our plugin is a regular Hydra Visual plugin If you need more information on how to create a VCL plugin, please refer to this article. As you can see, we are accessing the svcNewService, which is a TRORemoteService component located in our module controller. After casting it to the service interface, we can call service methods just like in regular RemObjects SDK clients.